We’ve all heard it: The clatter of the remote control hitting the hard wood floor. The grind of the disk tray on the DVD player being forcibly closed, often with something in it other than a disk. The gleeful laugh of a toddler that has our phone and is running away with it. Many issues, when it comes to protecting our technology or home theater systems are just annoyances, but others are genuine safety concerns — for your child and your electronics. Fortunately, there are many easy to use baby-proofing measures you can take to keep your new crawler or worse, your new climber, safe and sound while also protecting your technology. According to the Consumer Product Safety Commission, about 8-10,000 children are treated in emergency rooms each year because of tipover injuries, and televisions are major offenders. 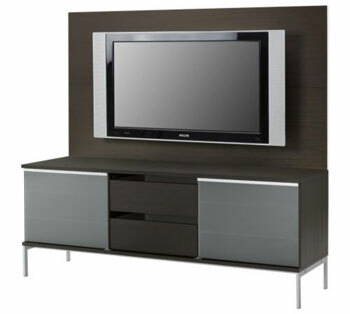 Flat screen televisions are front heavy and often perched on small lightweight bases. 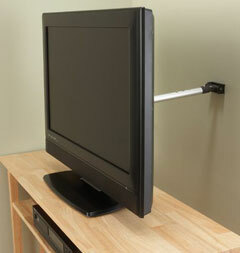 To carefully secure your TV you can secure it with a Prograde Flat Screen TV Lock. ($29.32 on Amazon.com ). All those flashing lights, sliding trays, and buttons, how they love buttons, make components like Blu-ray players, DVRs, cable boxes and iPod docks very tempting for sticky fingers. You can get an entertainment unit that holds your TV and electronics, with glass or frosted doors that close, like the TOBO TV panel with media storage ($319 on Ikea.com). You can secure the doors with childproof locks and secure the unit to the wall. Most remotes will work through glass. 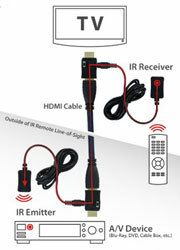 For those that don’t or if your unit has wooden doors, you can get an external remote sensor like the Sewell InjectIR ($44.95 on Amazon.com ) that sees IR commands from all of your remotes and transmits them to the to your components via HDMI. Though the standard plug covers are quite handy and inconspicuous for plugs you rarely use, they are finger breaking to remove. A product like the Kidco Outlet Plug Cover ($7.25 on Amazon.com), keeps kids off of the plug, allows you to shorten the cord and it’s easily opened for use. 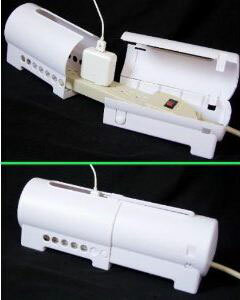 Since most of us are plugging in our entire lives, powerstrips are an issue as well. A Power Strip Cover from Safety 1st ($7.99 on Amazon.com) keep curious hands from yanking at the plugs. 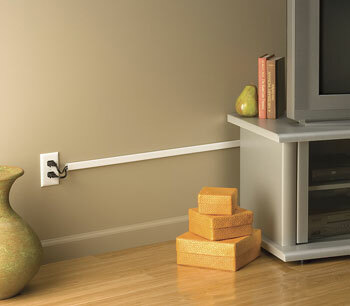 Hide cords behind cord concealers like the Wiremold CordMate II Cord Organizer ($24.99 on Crutchfield.com) if you’re running cables along a wall. Directly behind the TV, manage cables with zip ties or cover them with a wrap like the Monster Cable-It Wire Management System, which comes in three colors and several lengths ($12.20 for 8 feet on Amazon.com). The most oft dropped item deserves a little protection too. A Remote Control Cover from Remote Wraps ($15.99 on RemoteWraps.com) protects the device, the device’s battery door, and your furniture from getting banged up. Only available for DirecTV and Comcast remotes for, now, but we can hope. It is finally time to change phone service providers! Which do you recommend? That will depend heavily on where you live and what your needs are. First, ask friends who live near where you will be using your phone what service they use and if they’re satisfied. T-Mobile may be great in NYC, but not in Central New Jersey, for instance. Then consider your data and calling needs. If you are a huge data junkie, Sprint is the only major provider left with a true unlimited data plan. Whereas Verizon’s LTE network is by far the fastest of any we’ve tested. Find out from your current provider what your call and data usage has been for the last few months and plan accordingly. Finally, consider the phones. If you want an iPhone, T-Mobile won’t be an option, but they have a great selection of Android devices. Travel overseas a lot? You may be better off with a phone from a GSM service like AT&T or T-Mobile, or at least ensure that the phone you get from Verizon/Sprint is a “world phone”. My 10mth old loves ripping my conduit runs off the wall even tho they are mounted with 2way 25lb tape. Any suggestions on how to mount them? My 10mth old loves ripping my conduit runs off the wall. She pulls so hard she lifts the 25lb tape off the wall! I don’t want to use glues or other harsh substances so I am wondering if there are any alternatives? C an u send a website of the ikea tobo pls. I hav a baby and I desperately need it! Unfortunately, the Ikea TOBO is no longer available.